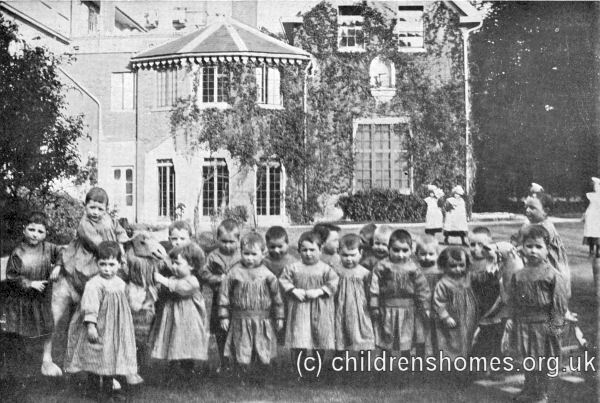 In 1897, the Crusade of Rescue (now the Catholic Children's Society, Westminster) acquired a large property for use as a boys' home at Fagg's Road, Hatton, near Feltham, Middlesex. In 1899, extensive works and alterations were carried out at the premises but the establishment appears not to have come into use until 1905. The home could accommodate up to 200 boys, aged 2 to 12 years at their time of admission. The boys moved out in 1923 and the home was underwent substantial alterations and improvements. On June 1st, 1924, it was re-opened by Cardinal Bourne as St Anthony's Home for Girls, now run by the Daughters of Charity of St Vincent de Paul. In 1935, a new home for small children was erected at the site. It accommodated up to 45 girls aged from fifteen months to five years at St. Anthony's. Two years later, a babies' home was added where 20 infants aged from newborn to fifteen months could be housed. Feltham was now able to provide for girls from zero plus until they are able to leave school and earn their own living. The Feltham site was closed in 1962 and the inmates transferred to the Crusade of Rescue Home at 73 St Charles' Square, North Kensington. The Feltham buildings were subsequently demolished as part the expansion of Heathrow Airport. Daughters Of Charity Of St Vincent De Paul, Provincial House, The Ridgeway, Mill Hill, London NW7 1RE. (Archivist: Sister Bernadette Ryder DC) Has one register (1923-30). Catholic Children's Society (Westminster), [formerly the Crusade of Rescue] 73 St Charles Square, London W10 6EJ. To enquire about access to the records of a child who grew up in one of the Society's homes, fill in the request form on the Society's website. No registers, but has some card indexes and files.